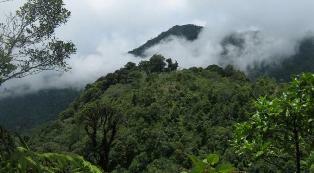 The common species found in these forests are Anogeissus latilolia, Albizzia procera, A. lebbek, Boehmeria rugulosa, Lannea coromandelica, Terminalia bellerica, Mallotus philippensis, Wendlandia heynii, Bombax ceiba, etc. The middle storey consists of trees such as Acacia catechu, Hymenodycton excelsum Mitragyna parvifolia, Aegle mamrmelos, Garuga pinnata, Erythrina suberosa, Casearia elliptica Emblica officinalis Bridelia squamosa, Gmelina arbores, Kydia calycina, Litsea glutinosa, Trewia nudiflora, Ehretia laevis, Cassia fistula, Sterculia villosa, Zizyphus xylopyra, Z. maurutiana, Butea monosperma, etc. The common shrubs of these forests are Carissa opaca, Adhatoda zeylanica, Colebrookia oppsitifolia, Leea crispa, Murraya koenigii, #Calotropis procera, #Clerodendron viscosum, Woodfordia, etc. The common grasses found in these forests are Apluda mutica, #Heteropogon granularis, #Chrysopogon fulvus are Apluda mutica, #Setaria glauca, Imperata cylindrical, etc. Climbers such as Ampelocissus latifolia, #Tinospora cordifolia, #Cissampelos pareera, #Ventilago denticulate and ichnocarpus frustescens are also found.